Awarded for service during the Sepoy Mutiny in India, 1857-58. The 9L were awarded clasps for the battles at Dehli, the Relief of Lucknow and Lucknow. 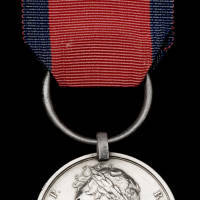 The 12L were awarded a clasp for their service in the campaign in Central India. 9L were the only imperial troops to be awarded three clasps to this medal.